Chances are pretty good that the habits you developed in learning to drive your first car are still present in your body today. In other words, if you had to reach for the gas pedal because it was a little far, your pelvis may still be rotated like that when you drive now. If you are the parent of a teenage driver, I highly encourage you to help them establish good lifelong postural habits when they are driving along with the driving itself. With the average American driving well over 6 hours per week, ‘how you are doing it’ is very important. 1. Keep the pelvis upright and all the way back in the seat. The slumping low back posture kids have at school and adults have at the office, often translates right into the automobile. If your pelvis is not upright, your upper body can not be upright either and your head will come forward causing upper back and trap tension. Unfortunately car makers know this about us, and are designing seats to accommodate the slumping posture. That makes it extra difficult to sit up ergonomically. Obviously some seats are better than others, but seats with lots of adjustment options are usually the best at facilitating good posture. 2. Feel even pressure on the back of the seat in both the right and left side of the pelvis. What this means is that your hips should not be rotated with one further forward than the other. This happens when the gas pedal is too far away, or people are fearful of sitting too close to the steering wheel in case of airbag deployment. Regardless of the reason, the hips should not be rotated. I am happy to report that some cars now have movable gas pedals, which can alleviate the problem. 3. Feel the right and left sitz bones (what you are hopefully sitting on) with fairly even weight/pressure into the seat. 4. Make sure the knees are not higher than the hips. When the knees are higher than the hips, the weight of the body is primarily in the pelvis and lower spine; Sacroiliac joints (S.I. Joints) hate that. Keeping the angle of the legs at 90 degrees from the body or more allows some of that weight to distribute into the leg and foot. This is a hard sell to very tall people who are accustomed to having their legs feeling folded up everywhere they sit. Most car seats now have adjustability for tipping the front of the seat down to help bring the knees away from the abdomen. Sports cars that have bucket seats are actually designed to tip the weight of the body back into the pelvis. Although I love sports cars, they may not be the best choice for a long drive for this reason. Best to save for special occasions. 5. Let the elbows hang down and avoid leaning on the door OR the console. The elbows are poised to create postural problems with the ribcage and neck. When the elbows are held out to the side, the muscles at the base of the shoulder blade become stiff and can develop a holding pattern that actually prevents the should blade from being able to descend on the ribcage. This makes for lots of trap tension which is probably the number one reason people seek out massage. Adjust your steering wheel so that the elbows can hang down with ease and try to remember during stressful driving moments to relax your elbows. Additionally, leaning one arm on the door or console can lead to the ribcage shifting to one side. Years of doing this will imprint the leaning ribcage into the soft tissue and can eventually begin pulling on the spine. For some reason people think our bodies just go back to the middle after doing things, but they don’t, especially when their is a lengthy static posture involved. 6. Make sure the left foot is flat down on the ground. There is a place in most vehicles for your left foot to go. It may not work for everyone as it is not typically adjustable. The biggest thing to know here is that the foot should not be rolled over to the side or the heel propped up. The twist of the foot and calf can mess with good knee tracking and the lifting of the heel can cause chronic calf tension which will also eventually effect the knee and the plantar fascia (fascia under the feet). 7. Let the legs fall open if they want to. It may feel wrong to let your legs fall open (especially for women), but holding them in parallel requires tension form the lateral quads, tensor fascia lata, the IT bands, and the fibulas muscles- basically the entire outside aspects of your legs. If your legs go parallel naturally and without having to hold them, you are in the minority and in luck as this would be better for you body. But for most of us that have a a little bow in our legs or knock knees or constantly tight hips, we don’t need to add any additional tension! Just let your legs fall where they want to. 8. Do not hold your gas pedal leg up in the air! The weight of the right leg should be falling down, not held up. It is your lower back muscles that will be holding the leg up, so put it down! 9. Move your whole foot and leg from the gas to the brake, do NOT pivot on the heel and use your toes on the pedal. This may sound a little crazy, but I have met lots of folks that do this. I don’t have a good sense on why their bodies have chosen this way of moving, but it will make the right hip VERY unhappy after years of driving this way. 10. Don’t have a dominant hand that does all the driving. Make sure you try to use both hands on the wheel for safety of course. But in reality, most people drive with one hand. Make sure you are not always using the same hand as that will create uneven tension coming up into your shoulders, neck, jaw, upper back, and make it more likely your pelvis is sitting off to one side. 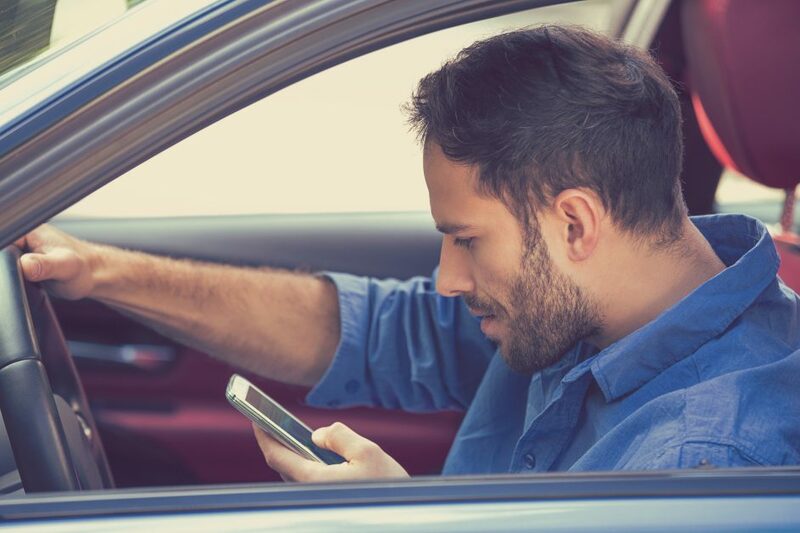 Using one hand on your phone and the other on the wheel is dangerous for your posture along with obviously endangering every other driver and pedestrian you encounter. You may notice that I didn’t get into where your head and neck should be. That is because you can not fix those issues without first fixing what you are sitting on. Of course you can pull your head back when you feel it hanging out toward the windshield. However, I would question what your pelvis is doing as it is most likely the reason your head feels the need to go forward in the first place. Bad driving postures add to stress in your body and mind. In today’s society we need to take every step possible to remove unnecessary stresses. Improving your driving posture will help to improve your life.